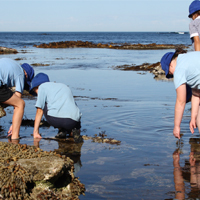 The 'Inspiring Young Scientists' program highlights a unique partnership with Deakin University and provides opportunities for our students to work collaboratively with 'real' scientists to undertake authentic research in our local marine and estuarine environments. 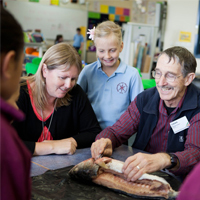 In 2014 Inspiring Young Scientists embraced new partners in the Melbourne Zoo with the Seal the Loop marine entanglement community awareness program and Victoria University with the Fluker Post Project. 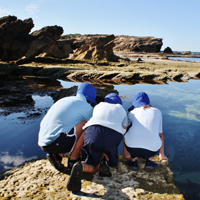 Warrnambool East P.S. has two Fluker Posts in coastal locations around Warrnambool for people to photograph the location from the static post and then email images to the Fluker Post Project - we are creating an ongoing digital story of these locations over time. 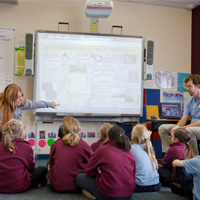 The students are providing information to the Warrnambool City Council Coastal Advisory Board.